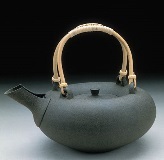 John Neely, “Teapot,” reduction cooled. Neely maintained reduction conditions in his kiln during the cooling period. In this way he was able to produce the black body color we see in this piece. A glaze would be redundant here. One of the things all ceramic artists have in common is that we all need to fire our work in a ceramic kiln if we want it to last. Okay, there are some who are experimenting with ideas of permanence and fragility who make raw clay objects solely for the purpose of letting them erode, but that’s the exception rather than the rule. The rest of us need a ceramic kiln. Not only that; we need to know how to use it, what it does (and what it won’t do). There are few folks around with as much insight into this aspect of ceramics as the late Richard Zakin, and in this post, he walks us through all the major considerations of ceramic kiln performance. If you don’t already have a ceramic kiln, read on to find out how to build a sawdust kiln out of readily available materials. Enjoy!—Jennifer Poellot Harnetty, editor. A kiln is a chamber made from refractory (nonmelting) materials. The ceramist places ware in the chamber. Heat created in this chamber (or in a firebox close by) is contained there and so builds up to high temperatures. The ceramic ware undergoes the firing and cooling process. While clay can be fired in an open fire and does not require a kiln, kilns must be used to attain high temperatures. Furthermore, they allow the ceramist excellent control of heat rise and fall and protect the ware during the rigors of the fire. Therefore, almost all contemporary potters use them. The kiln designer’s job is to make a kiln that keeps its structural integrity over a period of many firings while being efficient and keeping heat loss to a minimum. The kiln must allow the ceramist to efficiently control temperature rise and fall inside the kiln. It must be carefully designed for safe and efficient use of the fuel and must protect the ware during the firing. It must allow the ceramist access for loading and unloading and must have a “spy hole” to provide a view of what is going on inside the kiln during the firing. This term refers to the oxidizing or reducing properties of the fire. These properties strongly influence the character of the ware. In the reduction process the ceramist reduces the amount of oxygen allowed to enter the firing chamber. A fuelburning kiln demands a great deal of oxygen: it is very natural for the atmosphere inside a fuel-burning kiln to become depleted of oxygen during the firing. Reduction leaves its mark on both clay bodies and glazes. It modifies color and visual texture. Clay body color is deepened, sometimes moving to rich oranges and reds and sometimes to gray colors. A strong visual texture is created by dark spots that occur in a random but pleasing manner over the surface of the piece. These are caused by particles of iron oxide which have been changed to black iron oxide in the reduction process. Glaze texture and color are also modified. The dark spots that mark the surface of the clay come through to the glaze and mark it as well. Glaze color can be strongly marked by reduction: for example, copper will turn a blood red, white glazes take on a cream color with a broken texture of dark spots, iron greens and ocher colors become burnt oranges and brick reds; sky blues become slate blues. David MacDonald. Here we see the rich surface of a sawdustfired smoke reduction piece. Flashing occurs because fuel-burning kilns allow the ceramist to subject the work to direct flame. In the flashed area, color will be deepened and the transition from one color to the other may be marked by unpredictable visual effects. Flashing occurs naturally in fuel-burning kilns. The ceramist may heighten the effect by modifying the flame path inside the kiln or by strongly reducing one or two burners in a multiple-burner kiln. Reduced and flashed work is valued for its rich and unpredictable character. We often associate reduction with the high fire but it is also used in the low fire and can result in very effective surfaces. Low-fire reduction lets us darken and enrich clay surfaces while leaving the surface of the clay completely revealed so that it may speak for itself. The black pottery of African village potters and the similar work of the Pueblo potters of the Southwestern United States are examples of low-fire reduction. So too are the carbon blackened surfaces we see from some raku firings and sawdust firings. To carry out a sawdust firing the ceramist packs the work in sawdust in a simple kiln structure, sets the sawdust on fire, and allows it to burn until combustion ceases from lack of fuel. As the sawdust burns, rich patterns of carbon smudging are left on the surface of the piece. Pieces fired in sawdust have a natural and direct quality that can be very appealing. Sawdust firing has the advantage of being economical – sawdust is usually free for the taking.The firing is carried out in a simple firing container rather than in a true kiln. These only require a top and a wall with small openings to allow air to enter and smoke to leave during combustion. The best thing about the sawdust fire, however, is that the work that comes from it is marked by the fire and this can be very appealing. Furthermore, sawdust firing is very appealing to students new to ceramics, it is spontaneous and can be quickly learned. Pieces intended for the sawdust fire can be painted first with stains or terra sigillata. The sawdust fire is very effective with these surface coatings and the fire markings are emphasized. The sides of the structure should have openings to allow ready access of air to all parts of the densely packed sawdust. If the kiln is made from bricks (common red brick will do) they should be laid without mortar and with openings to allow air to enter. If using a metal garbage can (which works well) pierce the sides with a sharp tool to allow the entry of air. Applying a stain to the surface of the piece. Placing the piece on a bed of sawdust. More sawdust will be added to cover the work. Placing wadded up newspapers on the sawdust to start the fire. Covering the fire with sheets of metal after the sawdust has been ignited. Removing the cooled work a few hours after the four to six hour firing is finished. The darkened work can now be cleaned and waxed. Place a layer of sawdust in the base of the kiln. Place the pieces to be fired in the kiln and surround them with sawdust. If you wish the fire to proceed fairly slowly (the safest option), pack the sawdust fairly tightly around the pieces. Cover the pieces with a layer of sawdust. Place the metal lid over the kiln, temporarily leaving a gap of a few inches to create a bit of a draft. Start the fire with pieces of paper and let this burn for a few minutes. Close the lid of the kiln. During the first hour check the fire periodically and restart it if necessary. After 30 minutes the fire should be well enough established to stay lit until all the sawdust has burned. Unload the pieces the next day and brush off any burned sawdust. Lightly wet the pieces and wax and buff them. If a piece is too delicate to wax and buff, spray it with a transparent acrylic medium or a liquid wax. African village potters create a low-fire reduction ware whose surface is a rich, lustrous, dark black. The work is fired in the open in impromptu firing structures composed of the pots plus shards and fuel. Firing takes place over a very short period – perhaps an hour or two. The method differs from sawdust firing in that at the end of the firing, the potters pull the still hot work from the fire and pour oil over it. The oil quickly burns and stains the surface of the piece carbon black. This is polished and the piece is done. The surface color is more uniform than that from a sawdust fire. Although this method is very simple, the resulting surface is very elegant and effective. In this kind of firing oxygen is allowed free access to the kiln chamber. In the past this was not so easy, wood-fired kilns naturally went into reduction during the firing. Even then not all ceramists fired in reduction. For example, lead glazes boil and bubble in reduction. Ceramists who finished their pieces with lead glazes took the trouble to control their kiln firings and avoid reduction.With the advent of modern kilns it became very easy to fire in oxidation. Fuel-burning kilns, whose burners are fan driven, lend themselves to oxidation firing. The very popular electric kilns not only lend themselves to the oxidation fire; most of them are not designed to be fired in reduction at all. The contemporary ceramist must decide whether to use an oxidation or reduction firing atmosphere. This will dictate the choice of a kiln. Neither oxidation nor reduction is superior; both are tools to be used by the ceramist when appropriate. access, artists, atmosphere, base, black iron oxide, body, brick, brush, carbon, ceramic, ceramic artists, ceramic kiln, ceramic ware, ceramics, chamber, clay, clay bodies, clay body, color, colors, combustion, considerations, contemporary, designer, draft, elegant, entry, firebox, firing, firings, flashing, gallery, glaze, glaze texture, glazes, heat, high fire, how to, influence, iron, iron oxide, kiln, loading, low fire, materials, natural, open, openings, oxidation, oxidation firing, painted, paper, patterns, pieces, pots, potters, pottery, process, raku, raw clay, reduction, reduction firing, refractory, richard zakin, safe, sawdust firing, sawdust kiln, shape, short, sigillata, size, stains, students, surface, surfaces, terra sigillata, texture, tool, tools, transition, ware, wax, wood, wood fired. 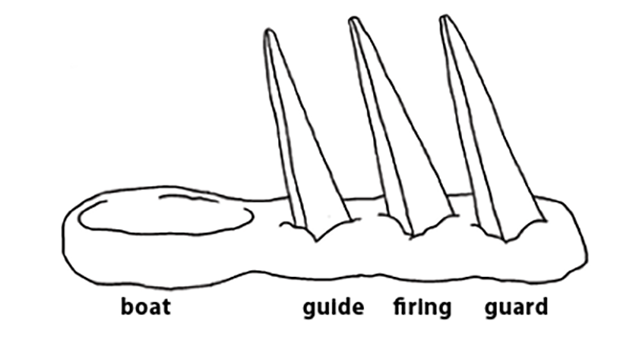 How much smoke is generated with these firing methods? Can they be used in an urban setting with regulations about leaf fires, etc? Darrel moveing to Washing state and not takeing your gas kiln. I’am looking for a gas kiln if you are selling it. The idea is to get the red-hot pots into the metal garbage can (full of newspapers) as fast as you can and cover the can with the lid so that the smoke doesn’t escape, but stays in the can to help turn the pots black. P.S. FORGOT TO MENTION THAT A PIECE OF CHICKEN WIRE NEEDS TO BE SHAPED TO FIT OVER THE CROSSED COAT HANGERS! I’VE FIRED SUCCESSFULLY IN A METAL GARBAGE CAN, DRILLING HOLES AROUND ITS MIDDLE FOR TWO REASONS: (1) IT LETS YOU SEE THE PROGRESS OF THE SAWDUST GLOW, AND (2)BY INSERTING TWO STRAIGHTENED COAT HANGERS INTO FOUR SEMI-EQUIDISTANT HOLES, YOU CAN REDUCE BREAKAGE BY PUTTING HEAVIER POTS ABOVE THE COAT HANGERS SO THEY DON’T FALL THROUGH TO SMASH WHAT’S IN THE BOTTOM HALF. ALSO–A NEIGHBOR & CABINET MAKER WHO USED CHERRY AND MAHOGANY AND HAD TO BURY HIS SAWDUST TO DISPOSE OF IT UNTIL I MET HIM (WIN-WIN FOR BOTH US) GAVE ME SAWDUST THAT EMERGED WITH YELLOW AND REDDISH AREAS AS WELL AS THE EXPECTED BLACK–ON MY WHITE CONE 6 CLAY WHICH I’D BISQUE FIRED. I pit fire on a regular basis and have found I can use low fire glze in parts of the pieces too. I am really happy with my recent results…lots of fireings of few pieces has taught me alot. check out clay monk’s journal/blog by Hilary Chan for further experimentation techniques of sawdust/pit firings. great reading and many tips on his blog. intriqued by the African villagers’ technique. There’s lots of good ideas presented by the commenters too. (an owl flew right over me tonight…THAT was the best part! this is not a difficult effect to get. Maria Martinez did this with an old bed spring, metal lunch trays and dry dung. I use an expanded metal,kaowool-lined kiln, a propane gas burner, old newspapers and a garbage can with a lid.. This can be done with a pit firing. There are lots of ways to achieve this effect. It is ancient. It can be done effectively with a lot less work than is described in this article. You dont have to use oil. You can fire greenware and get this effect, but I bisque fire my pots,in an electric kiln, then black fire them. This reduces the chances of breaking GREATLY! There is a pottery workshop held twice yearly at the Fremont Indian State Park in Utah, where we teach this method. I have used newspaper and sawdust combined, but the newspaper gives a great black by it’s self. The surface can be shiny, if well burnished, or matt if not burnished. The whole idea is to force carbon from an organic source into the surface of the pot. This happens when the red hot pot is suddenly and totally deprived of oxygen, like putting it in a metal, airtight, garbage can full of wadded up newspapers, and putting a tight lid on it! Zakin’s book was one of the first we bought when we started and I highly recommend it to everyone. There is no substitute for having one’s own kiln and going through the joys and agonies of the learning process. Many thanks to CAD for posting this article; whereas it is not a process I will undertake soon, it may be one for future endeavors. The Indians in Mexico also produce a black pottery that is known throughout Mexico for its beauty; I believe it is low fire as well. For the black surfaces, I wonder what kind of oil is poured over. Is it vegetable oil or could you use motor oil? Very interesting. We are moving to Washington state in the next few years and I’m not taking my large gas kiln with us,hoping to build a wood kiln up there. Plenty of fuel from wood to sawdust as I’m also a cabinet maker. As for Kathleen I think their talking bisque and glazes but I may be wrong. Is this for Bisque or Greenware? I have pit fired Low fire greenware and Bisque stoneware but wasn’t sure which was used in this.